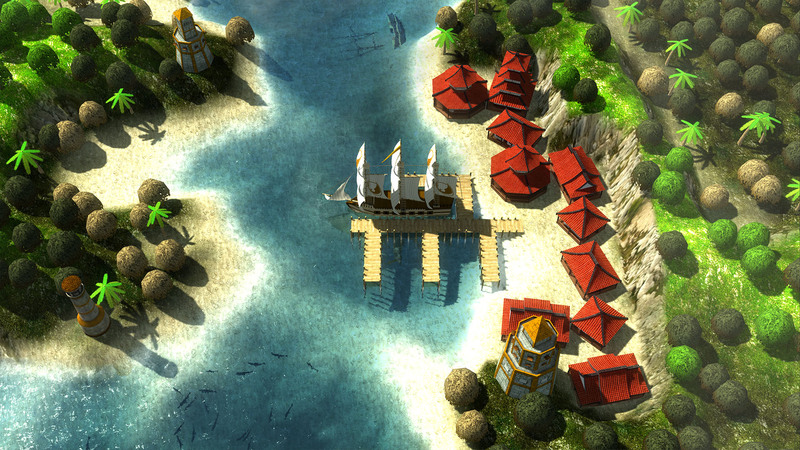 Windward is a fun-filled action game that turns you into a pirate! Er…okay, well you can become a pirate, but ideally you should be a noble sailor. It’s a sandbox game by Tasharen Entertainment that puts you behind the helm of a ship, sailing around a procedurally generated world. You can sail around completing quests for various towns, fight off pirates and reclaim captured villages, collect and barter goods, among other things. Let’s talk about it. The game has a single player mode which I think of as “relaxation” mode. You can opt to adjust difficulty to make the AI harder or easier, but ultimately you go through single player mode at your own pace. You can opt to simply sail around the environment collecting floating gear and stopping at towns to purchase goods to upgrade your ship along the way. Each town has available quests, but you’re limited to two at a time in your inventory. The game also has an extensive upgrade system for your ship, both aesthetically and power wise. 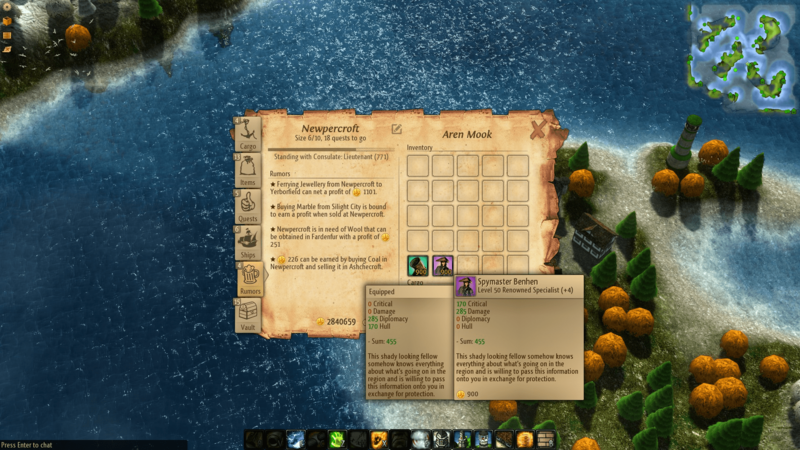 By completing quests for the villages in your instance (or any instance for that matter) you can rank up your Talents, which are essentially perks/boosters for your ship. Think of the skill tree in Borderlands, but more for making your ship stronger by 10%, faster by improving your sails, or giving the crew a boost in accuracy or damage. These are ranked up in levels by gaining experience, which you get by collecting and completing quests from towns. You can also rank up by defeating pirate ships, or if you are lucky, collecting cargo from the water. Usually you’ll find floating barrels or boxes and they have goods for you, sometimes you’ll gain gold or XP for them as well. The online portion of the game however completely expands the single player mode. Do enough quests, earn enough gold and you can even buy a new ship entirely. New ships have more powerful defense and offensive capabilities, and also can hold more quests so you can earn XP even faster! Similar to the single player, each area is an instance, and you can sail to and from instances as you please (albeit with a slight delay/load time). You can complete quests from different towns just like single player, except now you’ve got real players sailing amongst you. If you start going into instances that aren’t controlled by the faction you represent, you might get sunk. Thankfully, you can opt to join non-combat instances where it’s more of a PvE situation, but the only thing players can do is collectively attack AI pirate ships. You can opt to change your instance into a combat one, but it requires agreement of current online players to do so. As far as difficulty goes, the system in place is fairly straightforward. You can opt to increase difficulty as you join an instance, and the further you travel from your origin instance (whichever faction area you joined in from) the difficulty will gradually increase. That system makes the game more fun because of the risk reward factor. The further out you travel the more likely you’ll find enemy pirates to sink, but the more difficult everything becomes because you’re now so far from “home.” It’s nicely done and if you can get enough AI respect you’ll have a few ships in tow to help protect you when the goin’ gets rough. Ultimately though, my thoughts on the game are simple: It looks good, not amazing, but the water effects are pretty great. Theres (thankfully) an option to reduce water effects for streaming since it might be too much for a low end video card like my laptop’s integrated card, but otherwise the environments and ships animate well too. The gameplay is smooth, and theres not much of a learning curve for a new player. Theres a bunch of people hosting beginner online lobbies/instances that you can join to help earn XP and rank your stuff up, without fear of constantly being sunk because you’re a low level ship. It’s a ton of fun to play whether you want to sail the high seas and conquer foreign lands, or simply relax and help towns grow, meanwhile taking out a few pirates along the way. It doesn’t require a high end pc to run, and also runs on mac too. Given the offline, co-op and online play, the game offers a lot to explore and tasks to complete. I recommend it. Already played Windward? Let us know your thoughts in the comments below, or tweet us!